We pride ourselves by creating the freshest, highest quality and most tempting mini donuts available. We have been in business since 2006 - all of our local return business is due to “donut addiction” as well as our accommodating, sociable and superior customer service. 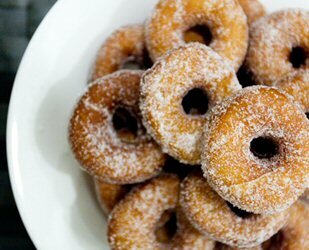 For your upcoming affair, let us help you create a unique and memorable event by providing you with our outstanding mini donuts. We are consistently told our mini donuts are the hit at every event! The incredible aroma creates a flurry of excitement with guests of all ages. No one leaves our events without a taste - and a big smile on their face! Over the years we have had the magnificent pleasure of creating our mini donuts for many fantastic companies, charities, families, celebrities, weddings, Bar/Bat Mitzvahs, special events and even the hospitality industry itself.